Forza Horizon 4 is an open video racing game with more than 100 co-operating car manufacturers. There are more than 450 different kinds of cars in the game, including many classic cars in the real world, such as the movie Ghost Party, 007 Car – Aston Martin DB10. The appearance of the DB10 is shocking, it looks very compact, the surface feels like a liquid smooth, and the exaggerated front and rear surrounds look almost unattractive. The use of large carbon fiber parts makes the body look very versatile, almost like a natural, shark-like shape. This shock will be further enhanced when the lightweight door is opened. Performance, the Aston Martin DB10 is equipped with a 4.7L naturally aspirated V8 engine, maximum power of 500 bhp (373 kW), maximum torque of 412lb ft (559 N·m), front engine, rear wheel drive, body weight 3400 Pounds (1542 kg), 51%/49% weight distribution, with a 6-speed manual transmission. The car accelerates from standstill to 100km/h in just 3.2 seconds and the top speed can exceed 300km/h. When you drive the DB10 through an uneven gravel and concrete pavement, this makes the DB10 full of various noises and vibrations. And this car has no airbags, and there is only one aluminum frame under the foot pad, which makes people feel that DB10 is a bit primitive. As you enter the formal road and increase the speed, the ride feels softer and the driving feel is very good. The engine speed is high and the tire grip is excellent, but it feels a lack of torque when going uphill. The DB10 generally feels fast and steady, but the longer wheelbase and wider body make it seem too calm, so when the grip reaches the limit, it is not so easy to adjust. 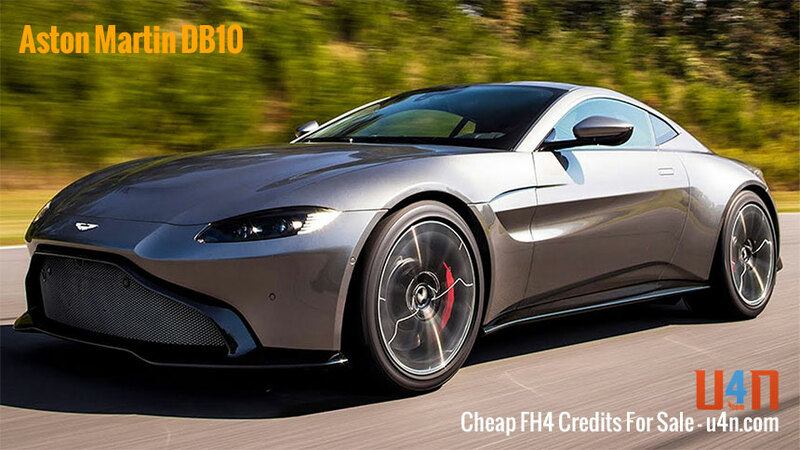 Although the DB10 produced 10 units, in the process of filming, 7 units were damaged. That is to say, there are only 3 units left in the world. It is impossible for ordinary people to own it. But don’t forget, now we are in FH 4, if you like it, you only need to buy a Bond car bag to get it easily. For 007 fans, it is a very worthy car, if you No, please be cautious to buy, because DB10 has no extra bonus to the game. If you are not sure, please read if the Bond Car Pack is worth buying.